A missing tooth can create severe difficulties in simple but vital tasks like eating and talking. Sometimes, it may make your social life difficult as well. For people with missing teeth, bridges and partial dentures are the usual tooth replacement solutions. They normally need surrounding healthy teeth for support. For these treatments, healthy teeth normally need to be shaped to anchor the bridge/dentures. In the long-term, this can cause the healthy tooth to decay or develop weakness. One of the latest advancements in cosmetic dentistry are dental implants. 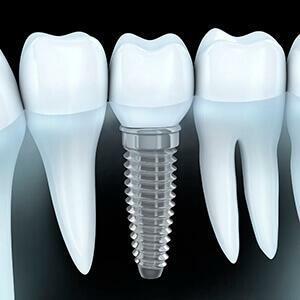 With dental implants, a titanium root is placed into the jaw bone to support a single crown, bridge, or denture. Dental implants are made of a biocompatible alloy (titanium or Zirconium) that fuses with bone to make a stable base for a new tooth that looks, feels, and works just like a natural teeth. Dental implants can be used to replace a single tooth, a few teeth, or an entire mouthful of teeth. With simple brushing, flossing, and regular preventive appointments, dental implants can easily last for decades. Almost any person who is fit to get a dental procedure can have dental implants. Since the jaw bone will anchor the implants, it is important that a patient has one healthy enough to support the new roots. Your jaw bone thickness can be checked by Dr. Sharma with the help of x-rays. If your jawbone does not have the right thickness, Dr. Sharma may need to perform more procedures before placing your implants. A good candidate for implants should also be free of gum disease and other overall health issues (such as uncontrolled diabetes or certain immune-disorders). For dental implants to be placed in the upper back jaw, Dr. Sharma may need to perform a sinus augmentation to raise the sinus floor and amplify the bone. Some jaw deformities can also create difficulties in the placement of dental implants, and Dr. Sharma can perform ridge modifications to help correct these problems. The dental implant procedure, whether you are replacing one teeth, or a few teeth, remains the same. The first step in the process is an oral surgery to place the implant post(s) directly into your jaw. After some time, the surrounding bone tissue will fuse with this post, creating a solid foundation for your restoration. Generally, it takes about 4-6 months for the implant to fully fuse with the bone. After you have healed, you’ll return to our office to have your new restoration placed onto the implant. At California Happy Teeth Family Dentistry, Dr. Sharma and her staff always recommend dental implants to help people permanently fill in the gaps in their smile. 1123 S. Park Victoria Dr.